Our family has been in Pembrokeshire for generations, and we have explored our home countryside thoroughly. These are some of our favorite place’s to eat, to see, and things to do, we hope you enjoy them to. If you have any of your own please let us know. HILTON COURT GARDENS . From Newgale on the Haverfordwest road take the first right after Roch, look for the sign. Excellent all day restaurant, great food good value. The treacle tart is a must. There are other shops and lovely walks here too. Fabulous cream teas on the decking. 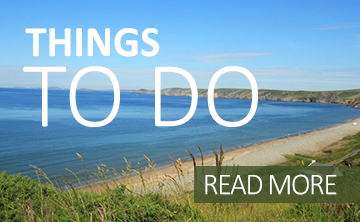 Its about an 8 minute drive away from the site at Newgale! THE BENCH ICE CREAM PARLOUR, 11 High St, St David’s, 01437 721778. Wonderful home made Ice cream. POINTZ CASTLE ICE CREAM, Pointz Castle, SA62 6BA, Solva, Pembrokeshire. 07968 096336. A new Ice-cream shop and Café! Get the best homemade ice-cream, with a variety of interesting flavours! Too good not to try! About a 5 minute drive from Newgale Coast Holiday Park. DRAGON & PEARL , Swan Square, Haverfordwest, 01437 763295. Good Chinese Restaurant with quick service. Families welcome. ORIEL Y PARC, ST DAVIDS. At the superb visitor’s center a great cafe, lovely fresh food and local and famous art on display. CAMBRIAN INN, SOLVA. For that special occasion. just 10mins drive from Newgale.01437 721210. TWR Y FELIN HOTEL: BLAS RESTAURANT. Twr y Felin Hotel, St Davids, Pembrokeshire, SA62 6QT. 01437 725 555. The Two Rosette Blas Restaurant located at AA Hotel of the Year Wales 2017 -2018, offers a menu influenced by the season and locality, with dishes designed to reflect Wales and its produce. The restaurant is about a 15 minute drive away from Newgale Coast Holiday Park. THE SHED BISTRO. Porthgain, Haverfordwest, Pembrokeshire, SA625BN. 01348 831518. If you want our opinion, this is the best place to get fish and chips in the whole of Pembrokeshire! Takeaway and Sit in is available. Booking a table is strongly advised. About a 24 minute drive away from Newgale Coast Holiday Park. TAJ MAHAL,2 MILFORD RD, HAVERFORDWEST, TEL 01437 763610. Smart , good quality Indian food with friendly service. Takeaway also. THE DUKE OF EDINBURGH, NEWGALE, 01437 720586. Good pub food with good beer, and you can walk home. DRUIDSTONE HOTEL A great place to have a drink and watch the sunset, they also do good food either as bar meal outside or a very interesting international menu in their restaurant, but booking essential. It’s a very “bohemian shabby chic” place, relaxed with locally sourced food. The location is outstanding and worth a visit. SOMETHING’S COOKING, 3 HAVERFORDWEST RD, LETTERSTON, TEL 01348 840621. A special fish and chip shop with a lovely restaurant, good menu, good quality food. Worth the trip out. WOLFSCASTLE COUNTRY HOTEL, WOLFSCASTLE, TEL 01437 741225. Superb cuisine, wonderful sweets. An old time favorite of our family. Lovely modern Brasserie, or go to the restaurant for that special occasion. CNAPAN RESTAURANT NEWPORT, Long standing family favorite! THE CANTEEN , Market Street, Newport, SA42 DPH. Has been rated the best place to eat in Newport by Trip Advisor. Serves remarkable homemade pizza and burgers and is open breakfast, lunch and dinner! All ingredients is locally sourced. Gluten free options and takeaway is available. NEWSURF, NEWGALE, 01437 720698, Surfboard, Kayak hire, tuition, coasteering, Kayak tours, beach webcam and a great surf shop. WEST WALES KARTING, COUNTY SHOWGROUND, WITHYBUSH , HAVERFORDWEST .01437 769555. Indoor go-karting .Great fun . OAKWOOD THEME PARK , CANASTON BRIDGE, 01834 891373. A fun day out for all the family. FOLLY FARM , BEGELLY, 01834 812731. Small & big kids love it. EAST NOLTON RIDDING STABLES ,01437 710360. Go for a ride along the beach or through a valley. Child or adult, novice or expert all catered for. HILTON COURT NURSERIES , HILTON MANOR, ROCH. 01437 710262. Great Lunches with an interesting garden center, lovely grounds, have a coffee with scones and cream out on the veranda. RAMSEY & SKOMER. Take one of the many boat trips to these beautiful Islands which are wild life reserves. NEWGALE PETROL STATION , MACE SHOP -ROCH , TESCO -HAVERFORDWEST, MORRISONS- HAVERFORDWEST.MARKS & SPENCER-HAVERFORDWEST. WINDOW ON WALES . SOLVA AND ST DAVID’S . Fascinating shops full of interesting gifts and gadgets. HILTON COURT GARDENS AND CRAFTS . ROCH . Excellent variety of crafts ,antiques ,gifts ,cafe ,plants and pots ,also lovely gardens to walk around. TREGWYNT WOOLEN MILL. Quality wool shop with Cafe. Interesting to see the woolen items being made. NARBETH TOWN is a small quaint country town which has a good selection of Arty and craft gift shops, worth a visit. Lots of places to eat. Bridge Inn highly recommended. HAVERFORDWEST TOWN is the main county town and has a good variety of small and large shops. PLACE’S TO SEE FOR FREE! These are walk’s ,small cove’s and harbors that you may not find right away .We love going to these place’s, but you will need a map to find them..
PEMBROKESHIRE BEACHES AND COAST. The beauty of Pembrokeshire’s coast and beaches cannot be described , but have a look at the brief youtube look at Pembrokeshire, produced by Pembrokeshire Counsil.SOLVA HARBOUR . Walks on both sides of the harbor. CAERFAI .On the coast near St David’s. Just look at the view, walk the coast path or go down to the cove. PORTH CLAIS .On the coast near St David’s. Walks on both sides of the small harbor. ST JUSTINIAN’S .On the coast opposite to Ramsey Island. Great views over to Ramsey Island, go down to Lifeboat station, or walk some of the coast path. WHITESANDS BEACH . Near St David’s. They charge in the car park here, but it is a lovely beach. ABER EIDDY .On the north Pembrokeshie coast near Croesgoch. Again another lovely beach, but what’s interesting here is the blue lagoon, follow the path north of the beach. PWLL DERI. One of the most spectacular views in Pembrokeshire. Good walking from here and great picnic spot. While your here, call in to Tregwynt woolen Mill , good coffee and nice gift shop. LLYSYFRAN RESERVOIR .Near Maenclochog. A reservoir in beautiful countryside. You can walk right around it or hire a bike or boat. If you wish you can fish. GWAUN VALLEY. Near Fishguard. A lovely drive, with some great walks. PRESELLI MOUNTAINS .Take the Cardigan road from Haverfordwest , look for the viewpoint near Rosebush, walks along the mountain ridges. ST DAVID’S CATHEDRAL . Spectacular building , lots of history worth a look . ST DAVIDS. The Grove , St David’s, 01437 720392. This is just opposite the Grove Hotel as you go into St David’s. HAVERFORDWEST. 01437 763110. Near the old Bridge.